St. Lynn's Press, 9780985562274, 140pp. Urban farming is the hot new movement sweeping the country: growing food closer to where we live, whether it's on a condo deck, in a backyard or in a community garden. 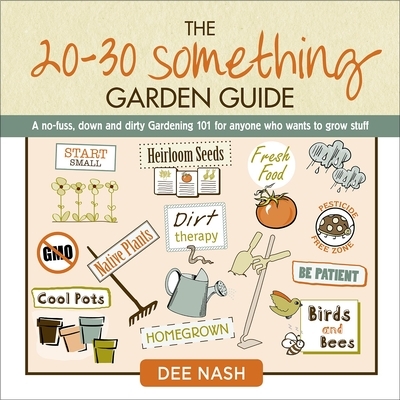 The 20/30-Something Garden Guide gives that busy, mostly urban, cohort a fun, non-intimidating introduction to the basics of gardening. These are the folks who want to know where their food comes from, and they're hip to the importance of good health and the environment. They may not have a lot of free time or change in their pockets, but if they could find a no-fuss Gardening 101 that spoke their language and gave achievable goals, they'd go for it. This is that book: high graphic appeal, fully illustrated, step-by-step projects and essential tips. Garden expert Dee Nash divides her book into four types and sizes of gardens, starting with "Farming Your Patio, Balcony or Deck," and giving incremental goals for the first year, and the second and third. With this guide as a basic roadmap, new gardeners can be as creative and out-of-the-box as they want. It's theirs to enjoy.